PapaLee Down With Gumbo Child! 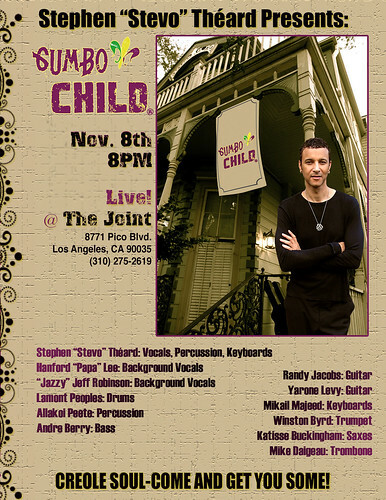 Y’all need to come out and check out my man Stephen “Stevo” Théard as he puts down his own funky brand of Creole Americana (tomorrow) Sunday night November 8th at 8:00 pm at The Joint on Pico at Robertson. The band is ridiculous and I will be singing back-up for my man. Stevo has made quite a name for himself as a drummer for artists such as Dave Koz and Terence Trend D’Arby, and now he’s moved out in front of the kit and is doing his own thang. Come out and show some love! This entry was posted in gigs, Uncategorized and tagged joint, steve o, theard, west l.a. by William Lee. Bookmark the permalink.